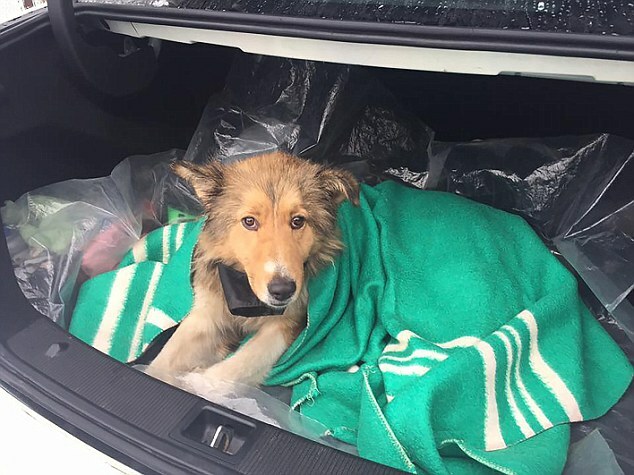 Cold, injured and stranded on a train track for two days, this terrified dog faced certain death. She was too injured to move from the tracks in Ukraine but her male friend Panda kept her alive by curling up next to her and pushing her head down when trains zoomed over. If locals in Uzhgorod came too close, then Panda barked to scare them away. 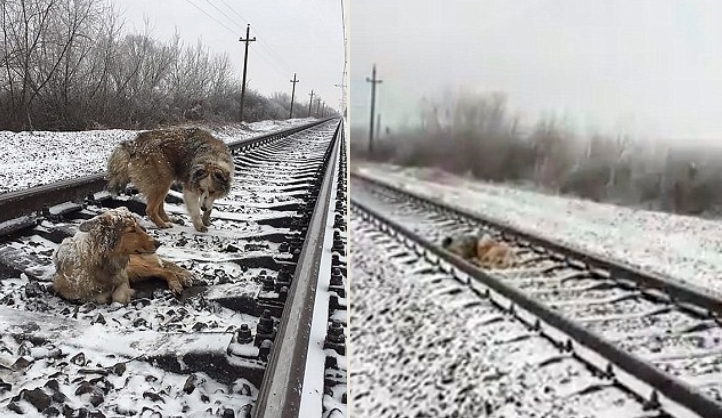 The pair were found by Denis Malafeyev, who shared a heart-racing video of the dogs dodging a train which sped over their heads. 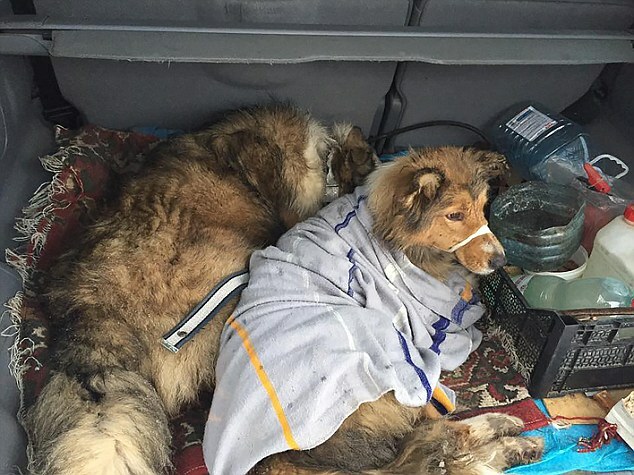 Even after they were rescued, they remained snuggled together in car boot on the way to the vets. Mr Malafeyev said it was unclear if she was injured after being hit by a train crossing the track. He added: 'It's such a touching story. I got a phone call from a friend who said that there were two dogs lying on the railway track near Tseglovka village for two days. 'When we arrived, it turned out that one of the dogs, the female, was injured and couldn't move. 'But the male dog was protecting her from us. I saw a train approaching - and felt sick. 'The male dog heard the sound of the approaching train, came close to the female dog and laid down next to her. 'Both of them pushed their heads towards the ground, and let the train pass. 'The male dog was doing this for two days in a row. Think about it. He was keeping her warm. 'Just to relieve the stress, the dogs are safe and sound. They have had medical assistance,' he said. Lucy had no fractures but severe bruises. The owners of the dogs were found and the pair have been returned to them. Responses to "Dog too injured to move saved by companion who protects her from trains"
Horrifying -- I didn't expect they could fit underneath. Sweet dogs with such true hearts! Such a story of true love....So glad they are safe now !!!!!!!!!!!!! !